Survey data collected by Plug-In America from current early-model Tesla Model S owners has predicted that up to two-thirds of early model electric-drive units may fail by 60,000 miles. If their predictions are even remotely accurate, that’s bad news. Despite the all-electric Tesla Model S being so impressive, even breaking Consumer Reports’ review scale, it is known that early production years of the car have had a decent share of reliability issues. This isn’t too surprising as Tesla is still a young automaker. The company reported in November a drastic reduction of these issues (by 50 percent) in their more-recent model years. Improvements aside, those early cars still face issues that first and second-hand buyers — and ultimately Tesla — are going to have to deal with, with a recent study conducted by Plug-In America — a neutral and non-profit party — claiming up to 66 percent of earlier model-year Model S drivetrains are likely to fail by 60,000 miles based on consumer-reported data. As reported by Green Car Reports, the sample data was run twice with the information they collected from early Model S owners. The analysis covered 327 respondents to the survey in October, or about one percent of 2012 to 2013 model year owners. 43 respondents were later model year (2014+) owners. The survey included inquiries about the mileage of the vehicles, ownership experience, whether or not the car had received a drivetrain swap, and if so, the mileage at the time of the repair. The data was then collected and processed using a Weibull statistical analysis for probability distribution, which estimates reliability lifetimes. The results map out the lifetime reliability for vehicle drivetrains that haven’t yet failed. The study concluded that 77 drivetrains had failed compared to 250 “suspends,” or samples that haven’t yet failed. The reliability engineer was careful to emphasize that the results were only valid if the data was correct, had no selection bias, and was random. While selection bias was definitely in play (only those customers who knew about the survey could choose to fill it out) the sample covered more than 1 percent of the total population of 2012 and 2013 Teslas (327 respondents for about 25,000 vehicles). So selection bias and randomness were probably acceptably low. But on a line-by-line review of the Excel data file, I noticed a few transcription errors which indeed compromised the result. 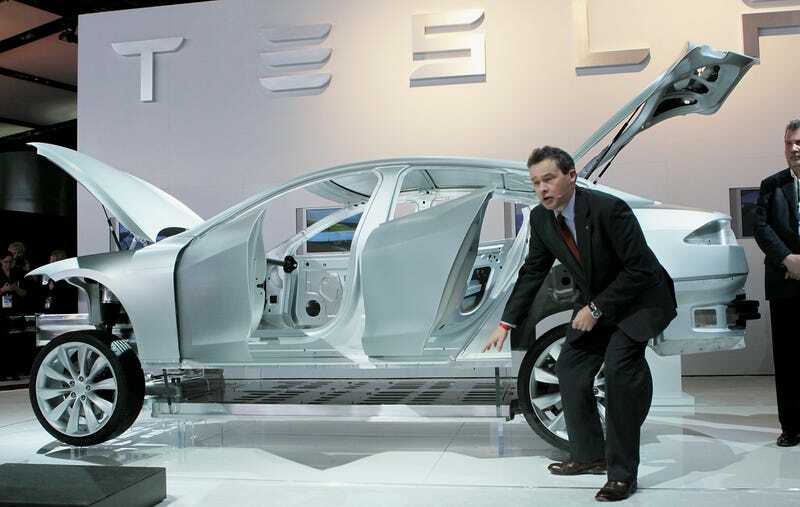 For 2012 and 2013 Teslas, the characteristic life rose to about 57,000 miles. (The probability function predicted that 66 percent of drive trains would fail within 60,000 miles. To clarify, the initial study by a “reliability engineer” found the “characteristic life” to be 50,000 miles. The second study, above, was worked by GCR using a free online software, which used the final odometer reading of the study data, concluding the characteristic life to be 57,000 miles before the drivetrain would need to be replaced. That is, again, based off of around only one percent of early Model S owners, with adjusted numbers to account for slight errors in the transcription of the original data, and including some models beyond the 2012 and 2013 model years. Also, this study does not account for all 100,000 Model S vehicles on the road, and with Tesla claiming a 50 percent improvement in reliability, the general reliability lifetime for all Tesla Model S models could be much longer than the reported 60,000 miles. On that same note, the sample data is only pooled from those willing to fill out a survey, and users who have experienced reliability issues are naturally more likely to be willing to submit to a reliability study. The study doesn’t focus on only 2012 to 2013 model years, and including the 43 later-model samples skews the result of the quoted headline. If the study is to reflect all Model S vehicles sold, it only represents 0.3 percent of the vehicles sold from 2012 to today. Either way the study isn’t strict by any standard, and a very rough estimation. Still, these early owners involved in the study are more likely to end up getting the drivetrain swap, which will be covered by Tesla’s eight year warranty that comes with every Model S anyway. It should also be noted that a drivetrain swap for the Model S is a standard maintenance practice for moderate to severe issues, and only takes 24 to 48 hours for a Tesla maintenance location to perform the swap. The results of the study do show that Telsa will likely continue to have reliability issues with their earlier vehicles which may negatively impact customer satisfaction. Green Car Reports has three pages of information on the study, including links to the data sets and a full description of their processes and reasoning, including charts! They reached out to Tesla with questions (with a list of what was asked), but the company refused to comment. It’s worth checking out.